← Big Picture series Part Two: Jupiter/Uranus and the new world order? I first selected the conjunction’s traverse through the four elements, the basic platform on which any astrological analysis rests, whether one is preparing an individual horoscope or looking at a chunk of historical time. The conjunction occurred only in earth and water signs during the period 500-76 BCE. What are we to make of this ? The above period roughly covers the time of the huge conceptual shift which occurred as mythological consciousness gave way to a more rational, objective view of the world and our relationship with the Divine. The work of the great Greek philosophers, culminating in Plato, which emerged during this period, had a huge influence on the course of Western civilisation from that point on. Symbolically, the movement of the Jupiter-Uranus conjunctions through the stabilising elements of earth and water could be read as significators for a time in history where the existing foundations of civilisation, and continuity of beliefs and the social order, were utterly disrupted at the most fundamental of levels. 75 BCE to 146 CE saw the conjunction going through a mixed transition period featuring all four elements, until the last conjunction in the earth element in 146 CE. This could be seen as the period where the struggle between the old order (earth and water) and the new (fire and air) was particularly potent, exemplified in the West by the battle between rising Christianity and the old Pagan beliefs of the dying matriarchal religions. It roughly covers the rise of the Roman Empire: its colonial expansion, bringing civilisation of an entirely new level of technical innovation and sophistication to large swathes of the known world, its Christianisation, and its fall in the fifth century CE. The next time that the conjunctions take place only in fire and air is from 1500 to 1845 CE. This period of history, set within the context of the mighty 500 year Neptune /Pluto cycle which began in 1398, is renowned for its optimism, creativity, faith in human progress, and huge scientific and technological leaps forward. There was the rise of European colonialism beginning with the great sea voyages of discovery. As already mentioned, we had the Renaissance, Reformation, Agrarian and Industrial Revolutions, and American and French Revolutions all during this time. Most significantly of all, in the eighteenth century we had the weave of the unfolding Scientific Revolution with the European Enlightenment, birthing a view of life more influenced by scientific materialism than religion for the first time in human history. Since 1845, we have been in a mixed transition period again which will last until about 2045. There is increasing realisation that the fire and air march forward into an exciting, rationally and scientifically based future has a hefty price tag attached to it. That is the literal survival of earth and water: the root of our being, the Earth itself. At the start of this new millennium, scientific progress rushes on ever faster. But disquiet increases, as evidence of the cost to our planet and our collective health becomes more and more compelling. From around the middle of the 21st century we will once again be moving into a period where the Jupiter/Uranus conjunctions occur only in earth and water for 350 –400 years. In the first example I gave, there was a move from an earth and water period, to a mixed element period, to a fire and air period. In the second example, there has been a move backward: from fire and air, to the mixed element period we now occupy, then earth and water still to come. In “Jupiter Meets Uranus” I made a strong case for the conjunction in Aquarius being “the one most powerfully connected to particularly radical and disruptive social, political and technological shifts”. (p.33) I then returned to examining the Big Picture from 500 BCE to 2500 CE for a second time, creating a table on this occasion which revealed the number of these Aquarian conjunctions throughout each 500 year block. My results were very, very interesting. 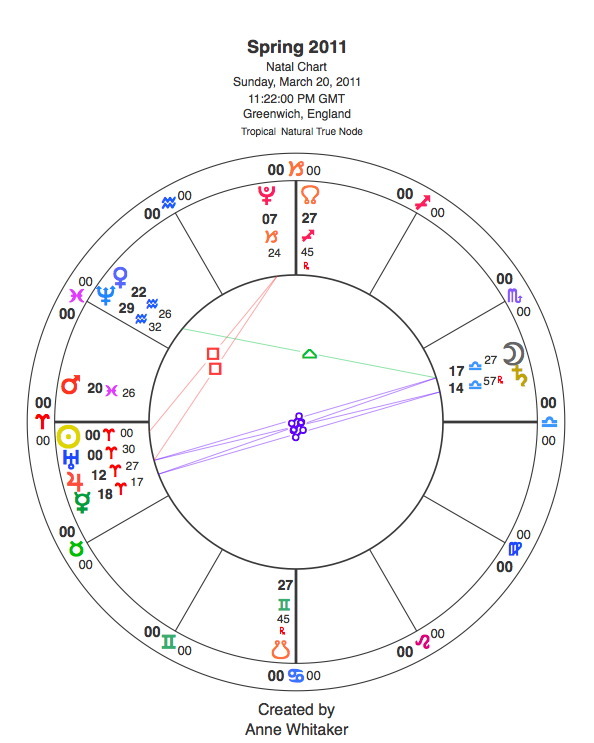 This entry was posted in Astrology Article Archive 4 – Spring Equinox 2011 and the Big Picture and tagged "as above so below", Anne Whitaker, Jupiter meets Uranus, Jupiter/Uranus conjunction 2010/11, Jupiter/Uranus in Aries, Uranus re-enters Aries March 2011. Bookmark the permalink.